SHTF 50 Single Shot Upper Conversion » Protective Solutions, Inc. The SHTF 50 Single Shot Upper Conversion system turns any standard AR15/M16 into a .50 Caliber Bolt Action rifle. The SHTF 50 is designed to fit any mil.spec AR15/M16 type lower. The SHTF 50 comes in 3 different barrel lengths: 18", 22", and 29" with . Scope rail options include Standard Low, Standard High, 20 MOA High and eXacto. Additional charge applies for 29" and for eXacto scope rail. Accessories also available. All items except 18" with Standard High scope rail are special orders. Request accessories and special orders via email at the Contact Us link above or by calling 248-787-4292. 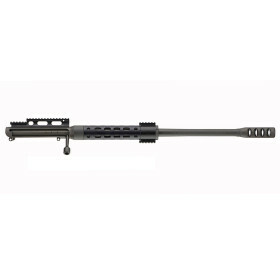 The 18" with Standard High scope rail is an in-stock item and can be ordered online. Muzzle Brake - 8 port steel. Threaded to muzzle. Scope Mount - Aluminum with Picatinney rail profile mounted on the receiver. Bolt Body - Machined from 4130 Chromemoly tubing.